Amy, you are proof this is true. Your strength and courage and openness as you battle for your life is remarkable and admirable. You are a beautiful warrior. You are all the cliches that are corny but exist because of people like you… because sometimes you just can’t find better words for someone. My life has been better because you’ve been a part of it. You’re dedicated, determined and devoted in your work, and I believe that this will carry you far in everything you do, especially this. 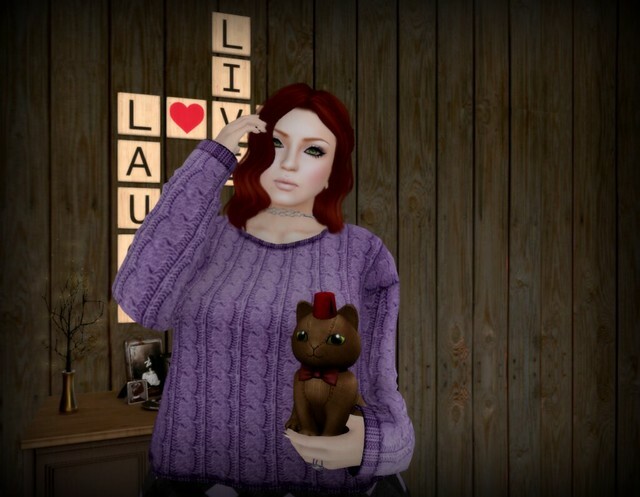 Your talent has brought joy and light and geekiness and laughter to my SL homes. Your kindness has made me believe that, in a world so often dark and cruel, there is light and gentleness yet. I am honored to consider you my friend. I sincerely hope Leaf on the Wind makes your London dreams come true… because you deserve to have all of your dreams come true. My outfit is by Somnia and will be available at Leaf on the Wind when it opens on January 10th. Both the top and skirt include a hud to change the colors, and both are available in lights and darks. If you are unfamiliar with Amy’s story, and the goal of the Leaf on the Wind event, please visit the Leaf on the Wind blog for more info.